This nine-day self-drive tour around Iceland’s ring road is the ideal way to explore all the magic that the land of fire and ice has to offer, taking you through some of the most diverse and beautiful landscapes on the planet. Your route will take you through a country packed with majestic natural wonders, including imposing volcanoes, mighty glaciers, jet-black sand beaches, cascading waterfalls and a plethora of other amazing sights that will leave you breathless. 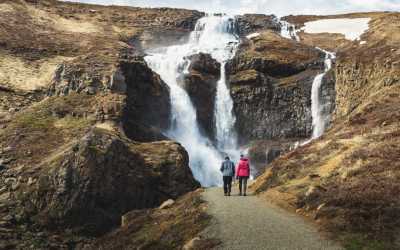 It begins on the iconic Golden Circle Route, where you will see the famous Gullfoss Waterfall famed for its majestic natural beauty; the historic Thingvellir National Park, where you can gaze across the gap between the Eurasian and North American tectonic plates and visit Althingi the site of Iceland’s original Viking Parliament; and the ‘Geysir’ area, where boiling torrents of water are propelled up to 30 metres into the air by the teeming geysers. Then continues to Iceland’s gorgeous South Coast, where waterfalls abound, the beaches are dyed black and the cliff faces are dotted by spectacular basalt sea stacks. It is a place of myth and legend, where Norse mythology comes alive and birds swoop above your head after nesting in the spectacular cliffs. It is also home to a number of huge glaciers, which you will explore with a certified tour guide during your stay. 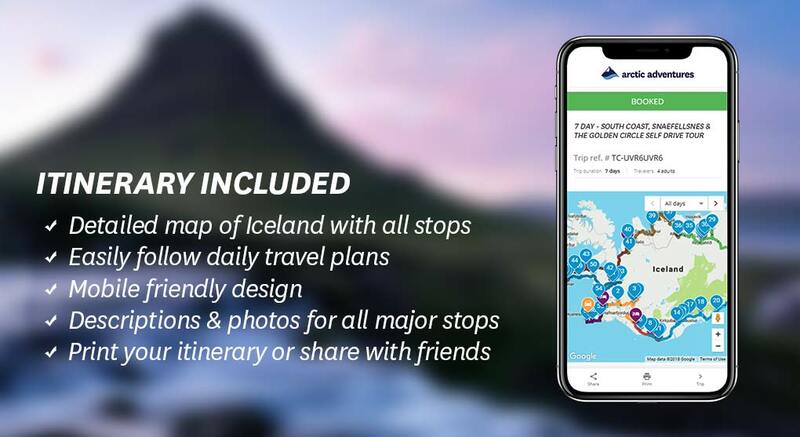 It then pushes deeper into Iceland’s more remote places, taking you through otherworldly landscapes, charming villages, crystalline fjords, capricious volcanoes, multi-colored crater lakes and much, much more. 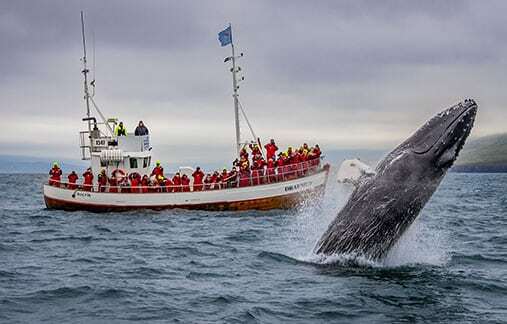 By the end of the tour you will be amazed by the diversity of Iceland’s wildlife, with Viking horses, wild reindeer, playful seals and adorable puffins, but a few of the creatures that you will encounter. Perhaps the most spine-tingling is the chance to see whales playing in their natural habitat. 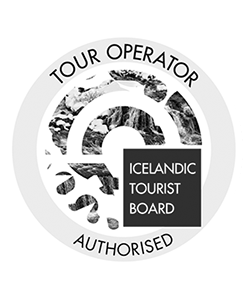 The tour is also perfect for those who like to relax, with the chance to soak in some of Iceland’s incredible geothermal pools. 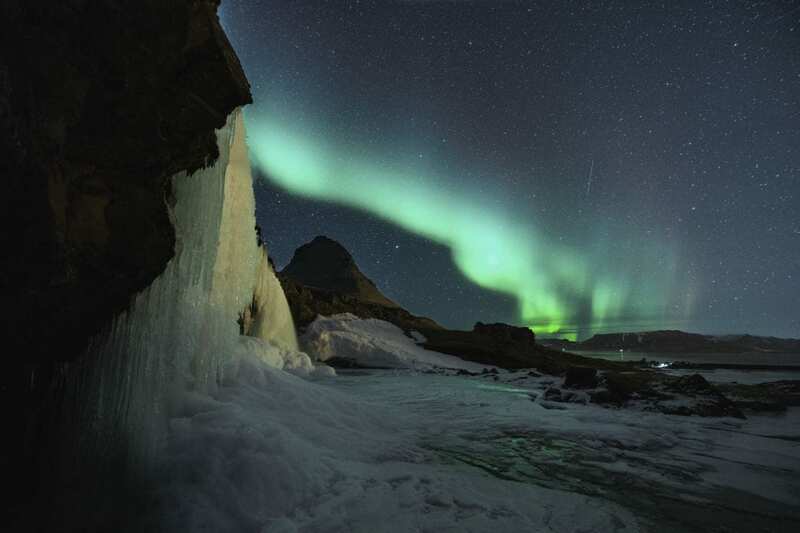 The land of fire and ice has something to cater to each and every taste and we guarantee that this incredible tour will provide you with memories that will last a lifetime. 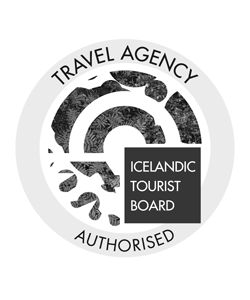 We provide everything that you need to enjoy everything that Iceland has to offer, including a detailed itinerary, a rental car, and accommodation, allowing you to explore all the magic that Iceland has to offer in any way you want. If you book for 2 or 4 persons you get twin / double rooms. If you book for 3 or 5 persons you get a combination of double/twin rooms and a single room. 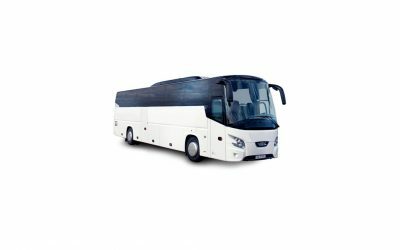 This tour is ideal for morning arrivals, as you can collect your rental car at the airport and hit the road straight away. If you are arriving later then we recommend that you book a night’s accommodation in Reykjavik, set it as your pick-up location and then begin your journey the next morning. Your adventure begins with Iceland’s iconic Golden Circle route, which features majestic natural wonders, landscapes steeped in history and a host of other incredible sights, making it a must for anyone visiting Iceland. The first stop on your journey is Thingvellir National Park, a UNESCO World Heritage site that is renowned for its historical and geological significance. It is the location of Althingi, where a group of Viking nobles convened Iceland’s first parliament in 930 AD, the modern Icelandic parliament still bears the same name, making it one of the oldest continuously running democratic institutions in the world. 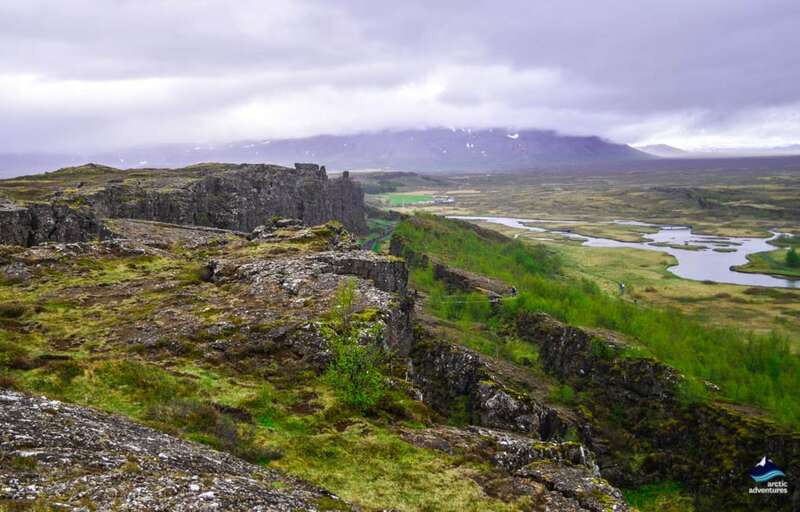 Thingvellir also straddles the Mid-Atlantic Ridge, meaning that you can gaze across the gap between the North American and Eurasian tectonic plates, which are still moving apart at a rate of around 2 cm per year. From there you will travel to the famous Geysir area, home to the legendary and now dormant ‘Great Geysir’, which is where the English word Geyser comes from. It is also home to Strokkur, a bubbling geothermal wonder that propels molten streams of water up to 25 meters into the air every 5-8 minutes. The entire area is incredibly volcanically active, making it the ideal spot to appreciate the awesome power of nature. From there you will visit the magnificent Gullfoss Waterfall (the golden falls), where a cascading stream of water crashes into an emerald valley below. It gets its name from the golden hue that the water takes as it passes across the two lava steps, while rainbows regularly form over the falls on sunny days. This makes the incredibly photogenic and one of the most popular sights in all of Iceland. The Golden Circle is home to a plethora of other amazing sights, including the stunning Laugarvatn Lake, which plays host to a luxurious spa with a spectacular view. Slightly, further along, is Flúðir, renowned for its many hot springs, foremost of these is the Secret Lagoon, which is one of Iceland’s oldest geothermal pool. The geothermal conditions in the village also make it ideal for the growing of tomatoes and you could stop off and taste one of the juicy local specialties. Another great stop is Kerið, a magnificent volcanic crater that was hewn into the ground many hundreds of years ago. 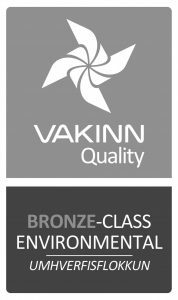 We will arrange accommodation for you in either the Golden Circle / Selfoss / Hella / Hvolsvöllur area. Day two will take you to Iceland’s famous South Coast, where you will find mighty glaciers, imposing volcanoes spectacular black sand beaches, gorgeous waterfalls and majestic rock formations. It is often described as ‘Iceland in a Nutshell’ and no trip to the land of fire and ice would be complete without a visit there. 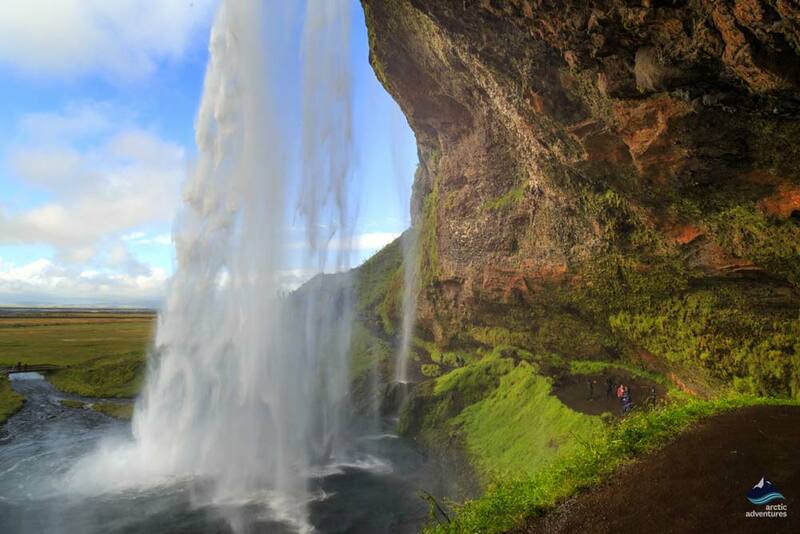 The first stop on your adventure will be the spectacular Seljalandsfoss Waterfall, where a cylindrical cascade of water tumbles 60 meters down into a pool below. It offers visitors the unique opportunity to walk behind its stunning cascade, allowing you to see this incredible natural wonder from a completely different angle. The hidden waterfall of Gljúfrabúi is situated just five minutes from Seljalandsfoss and offers a completely different but equally beautiful experience. 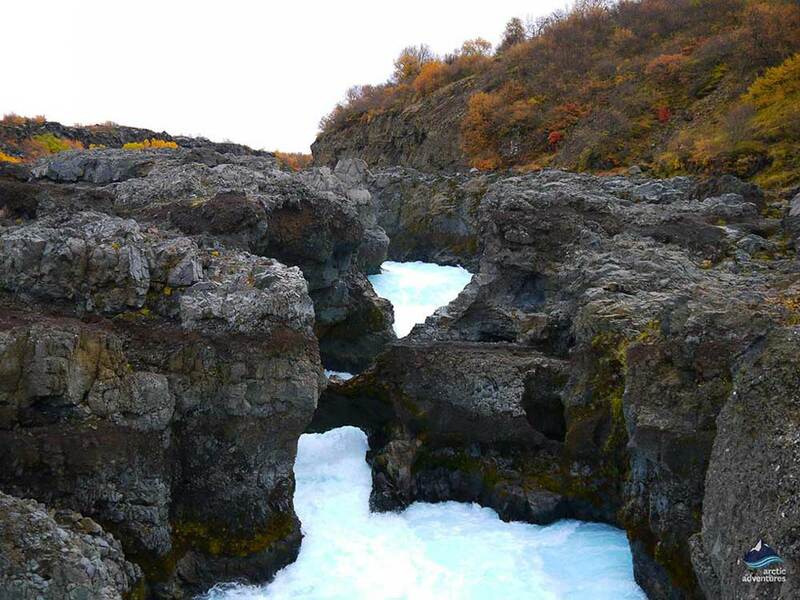 Gljúfrabúi is located in a sheer cavern, meaning that its beautiful cascade runs down the cliff face, although visitors should note that it is impossible to see it without getting wet! 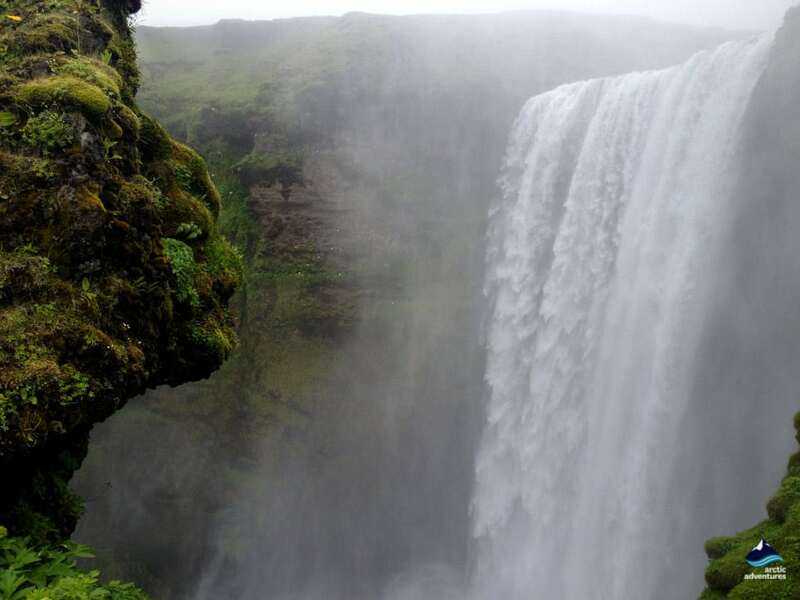 The final stunning waterfall on the South Coast is Skogafoss, where a wide torrent of cascading water gushes 60 meters down into a valley below. There is a meandering path that winds up the hill beside the falls allowing you to climb to the top and enjoy a magnificent panoramic view of the waterfall and the surrounding area. Skogafoss is also steeped in Icelandic folklore with local legend holding that the two rock formations which sit beside it are actually petrified trolls, who were so enamored by its beauty that they forgot about the sun and were turned to stone. There is also a small museum close to the falls, where you will find authentic turf-roofed houses and a plethora of Viking artifacts. From there the road will take you to the coast, where you will find Dyrhólaey, a dramatic volcanic cliff that stands 120 meters tall and features amazing rock formations, stunning panoramic views of the volcanic beaches below and incredible birdlife. Then you will descend down to the coal-black Reynisfjara beach, where the white-crested waves of the Atlantic Ocean provide a stark contrast to the foreboding volcanic sands. Just behind it is a series of stunning basalt columns, whose circular beauty is reminiscent of the Giant’s Causeway. Reynisfjara has been ranked as one of the 10 best non-tropical beaches in the world and more than lives up to that prestigious honor. You will then arrive at Skógar, where you can enjoy some lunch before heading over to Sólheimajökull for a glacier hike. 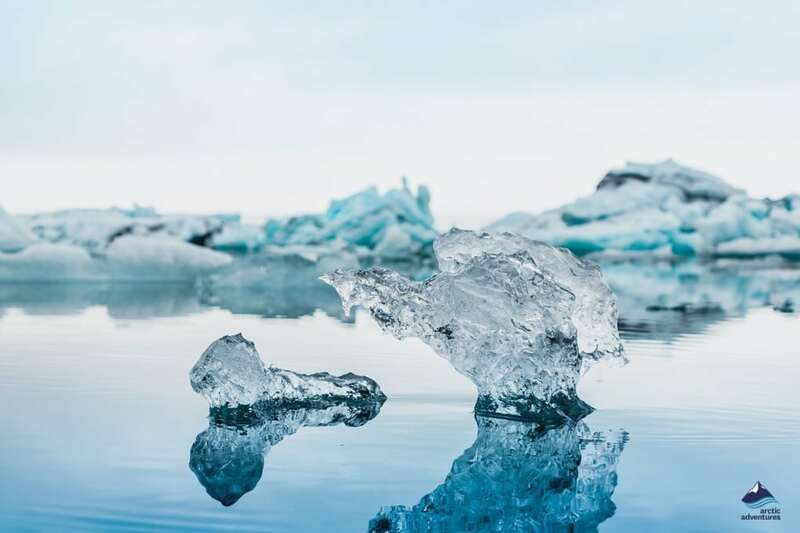 After lunch, you will experience one of the most exciting adventures that the Land of Fire and Ice has to offer: the chance to explore the vast icy wonderland of the Sólheimajökull Glacier. It all begins when you meet one of our friendly guides at our base camp close to Sólheimajökull, where they will help you get kitted out and give you a brief safety talk. 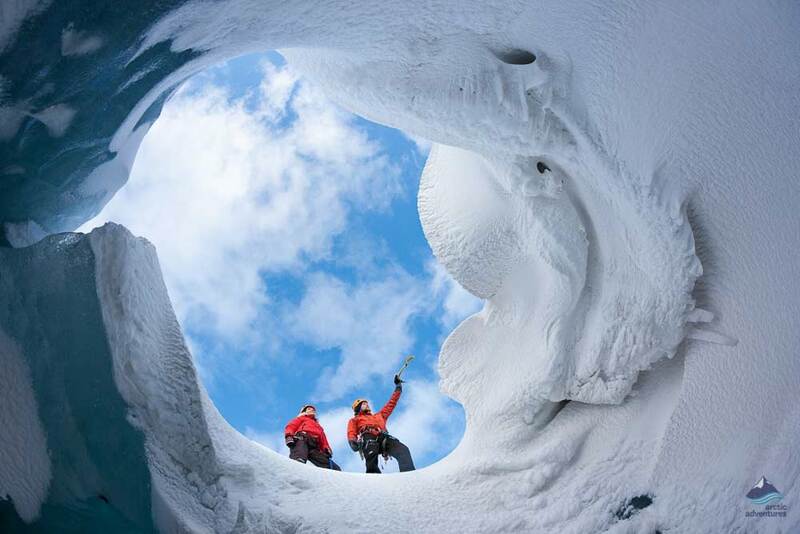 Then you will head out for an adrenaline-pumping hike, through a snow-carpeted world of ice crevasses and awe-inspiring ice-sculptures. The hike is considered easy and is suitable for anyone over the age of 10, who is comfortable walking on uneven surfaces. 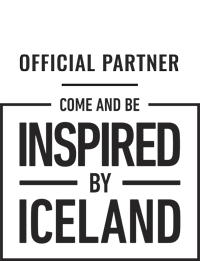 The whole experience is totally unique and will provide you with unforgettable memories of a genuine natural wonder. You will then arrive at the picturesque village of Vik, with it’s spectacular view of the jet-black beach and the amazing basalt sea stacks. We will arrange accommodation for you in the Vík / Kirkjubæjarklaustur area. The third day will take you to the very edge of Iceland’s South Coast, to a plethora of natural wonders, whose untouched beauty is truly mesmerizing. This dramatic landscape is defined by the mighty Vatnajökull Glacier, which is the largest in the entire of Europe. We strongly recommend that you make a stop at the gorgeous Skaftafell Nature Reserve, which is nestled beneath the Vatnajökull Glacier. It is home to some stunning hiking routes, including a two-hour loop that takes you to Svartifoss, renowned for being one of Iceland’s most beautiful waterfalls. There you will find a cascading stream of milky white water that crashes over a dramatic black cliff face, making for a stark and very photogenic scene. Further on from there is Iceland’s Hollywood Glacier, Svínafellsjökull, a popular film set that has been used by blockbuster movies such as Game of Thrones, Star Wars, Batman and many, many more. 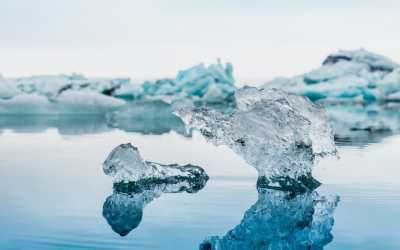 The next stop on your journey will be the breathtakingly beautiful Jökulsarlón Glacier Lagoon, where glistening hunks of jewel-like ice break off from the main body of the glacier and glide across the crystalline lagoon surface in a truly spectacular scene. This ever-changing world is one of the most photogenic places in all of Iceland and a spot of profound beauty that will make the hairs on the back of your neck stand on end. The icebergs eventually wash up on the aptly named Diamond Beach, where they glint like diamonds nestled on the jet-black volcanic sands. This alluring scene of dramatic contrast and truly mesmerizing beauty is rated as one of the best places in all of Iceland and will provide memories that will remain with you for the rest of your life. Your accommodation for the night will be in the Skaftafell / Höfn area. Day four will take you to Iceland’s northern coast, along a gorgeous road that is flanked by Iceland’s crystalline east fjords. There you will find towering mountains, whose beauty is only enhanced by the way that their reflections appear in the fjords below. The east is also an excellent place to see some of the rarer Icelandic animals, including reindeer! Your first stop will be the rustic fishing town of Höfn, renowned for the quality of the Norwegian and Icelandic lobster that are landed and then processed there. There is nothing quite like enjoying one of these delicious crustaceans fresh off the boat and we highly recommend that you try one. Your next stop will be the gorgeous Hvalnes Nature Reserve, renowned for its lonely yellow lighthouse which gazes out to sea and some of Iceland’s most beautiful mountains. This trio of gorgeous mountains, known as the Eystrahorn, Stokksnes, and the Vestrahorn are all uniquely shaped and surrounded by majestic natural scenery, including fjords, sand dunes and much, much more. The Vestrahorn has become particularly famous due to the fact that it is shaped a bit like the Batman symbol, earning it the nickname, ‘The Batman Mountain’. You will then continue you northwards along the East Coast, passing by a multitude of icy blue fjords, famous for their amazing wildlife and stunning natural scenery. We strongly recommend pausing to take in the picturesque fishing village of Djúpivogur, which is rimmed by majestic fjords and sits in the shadow of the pyramid-shaped Búlandstindur Mountain. We also recommend stopping at the nearby village of Stöðvarfjörður famous for its rare sea geyser called Saxa that fires jets of water into the air: a unique site that is well worth stopping off at. It also plays host to the stone collection of Petra Sveinsdottir, a local woman who has devoted her life to collecting interesting minerals and rocks from the surrounding area. The now deceased Petra, did this for close to a century, creating an unrivaled collection that is now on display in the town. As you continue along the road you will leave the fjord area and head towards the Lagarfljót Lake: a mysterious place, which is famed for being home to Iceland’s equivalent of the Loch Ness monster. This legendary creature of the deep is known as Lagarfljótsormurinn, or “the Lagarfljót serpent” and has been spotted by many people across the ages, even being caught on video in 2012. The lake is surrounded by the Hallormsstaðaskógur forest, which covers 740 square kilometers, making it Iceland’s largest and encompasses 67 different tree species. It is riddled with hiking paths and other places of interest, making it ideal for nature lovers. The road then takes you to Hengifoss (the hanging falls) a massive waterfall that measures a colossal 128 meters: there you will find a narrow torrent of water that runs over a series of colorful lava steps into a beautiful gorge below. The falls are also geologically significant thanks to the various lava steps that demarcate different geological periods. Hengifoss, lies slightly away from the road, meaning that you will have to take a short hike there, which will take you past a smaller waterfall called Litlanesfoss. 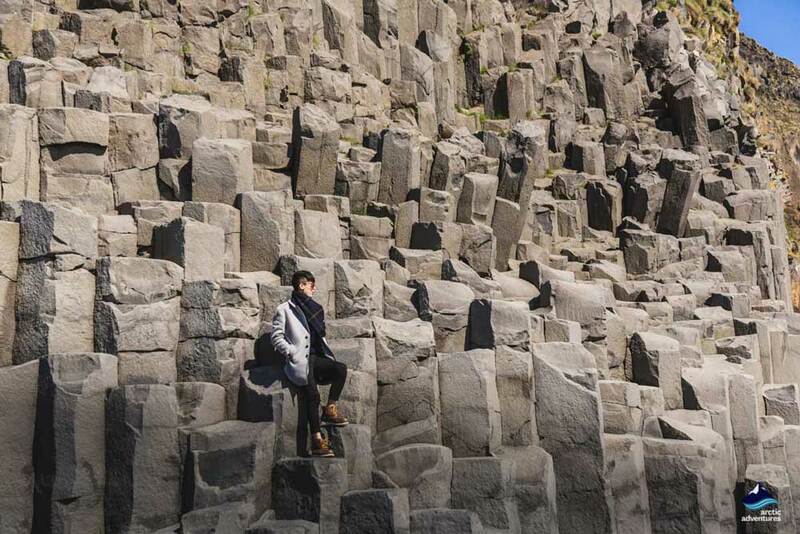 It stands 30-metres tall and is renowned for its unique system of symmetrical basalt columns. We will arrange accommodation for you in a country hotel situated in the Egilsstaðir area. The fifth day of your adventure will take you to Iceland’s north-eastern highlands, famed for their otherworldly landscapes and geothermal activity. The first stop on your journey will be Dettifoss, the most powerful waterfall in all of Europe, where a roaring cascade of water thunders over a cliff-edge at an incredible 500 cubic meters per second. It more than lives up to its nickname of the beast and will give you a sense of the power and majesty of nature. A short hike from the road lies the stunning Stóra-Víti crater a gorgeous crater lake that was carved into the earth by a huge volcanic eruption in 1724. It is now filled with sapphire blue water making it very beautiful and well worth making a stop at. The original eruption was so hot that it continued to boil for over a century. The otherworldly Námafjall Geothermal Field (otherwise known as Hverir) is situated to the east of Lake Myvatn. This lifeless landscape is filled with colorful mud pits, boiling fumaroles and a plethora of other geothermal curiosities. The sulfur released by the volcanoes gives the area a strange smell but also makes the landscape incredibly beautiful. This along with the imposing Mount Namafjall ensures that it is a truly unique experience that you are bound to remember. The iconic Grjótagjá Geothermal Cave is also situated in the Lake Mývatn area. Locals used to enjoy bathing in its volcanically heated waters, however, they are now too hot. Fans of Game of Thrones should make sure that they stop by it as this is where Jon Snow famously breaks his vows with Ygritte. The next stop will be the alien world of the Myvatn area, where you will find the spectacular Lake Myvatn, which combines geothermally heated waters with a plethora of craggy rock formations and other amazing sights. Lake Myvatn and the surrounding area is a volcanic wonderland that will provide you with memories that will last a lifetime. 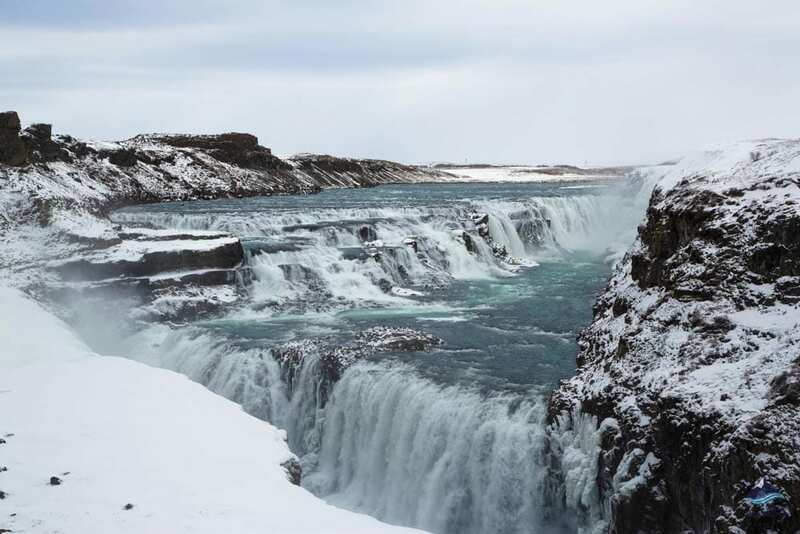 When you leave Lake Myvatn behind you will soon drive by the historic Goðafoss Waterfall (the waterfall of the gods). It is so named because the Lawspeaker of the Icelandic Parliament Þorgeir Ljósvetningagoði, cast his pagan statues into its frothy white waters and converted to Christianity in around 1000 AD, which is the moment that Iceland officially became Christian. This along with the beauty of the area makes it a must-visit for anyone in Iceland. 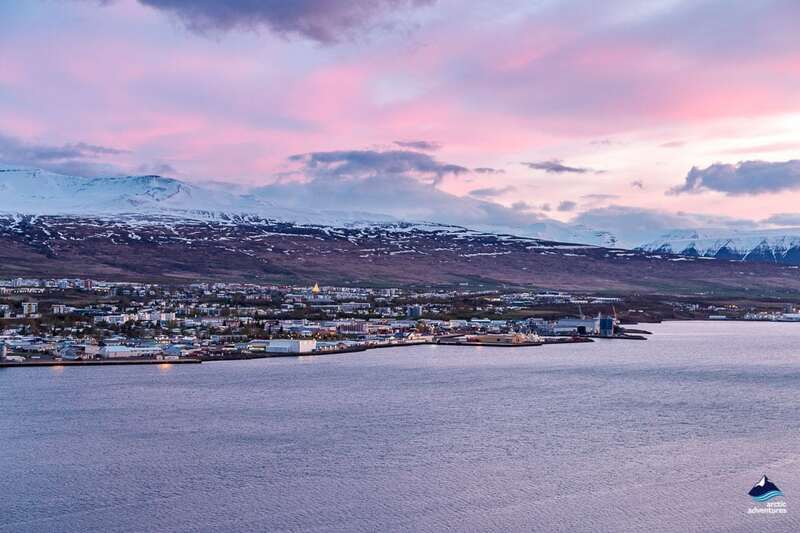 Iceland’s second biggest city, Akureyri, lies around a 45-minute drive from the Goðafoss Waterfall and is the perfect place to spend the evening. It sits in the beautiful Eyjafjörður fjord and is crammed with comfortable cafes and restaurants. 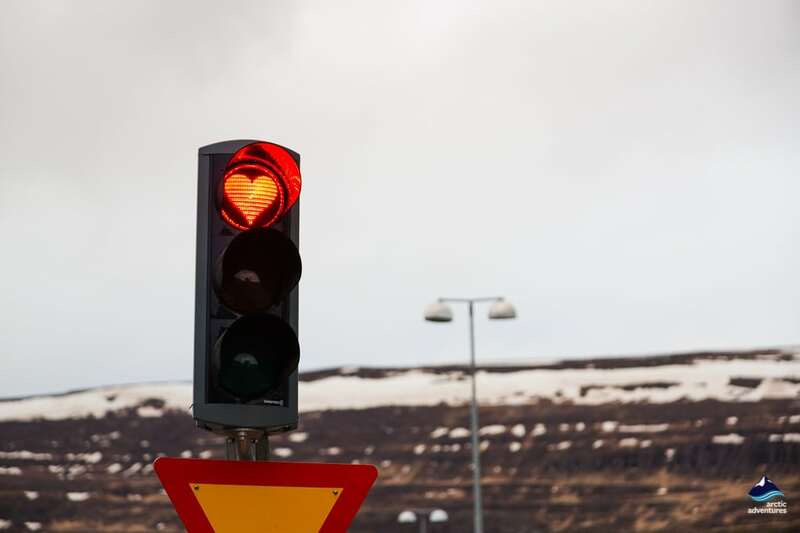 We will book accommodation in the Eyjafjörður area, so you can relax and enjoy a delicious Icelandic meal in preparation for the next day’s adventures. Day six begins bright and early when you make the short 30-minute drive from Akureyri to the picturesque fishing village of Dalvik. Enjoy walking around Akureyri in the morning. Akureyri is the second biggest city in Iceland. The city is nestled inside the beautiful Eyjafjörður fjord. Here you can find some cozy cafes, quality restaurants, interesting art galleries and an overall relaxing atmosphere! After your exploration in the capital of the North, you will head out towards Dalvík for an afternoon whale watching tour. Once you arrive at Dalvik, you will join one of our incredible whale watching tours, where we seek out some of the most amazing marine mammals on the planet. Dalvik is especially famous for humpbacks who regularly breach in the surrounding bay. The tours have a 99% success rate, meaning that you are virtually guaranteed to spot something, with white-beaked dolphins, minke whales, humpback whales and small harbor porpoises all regularly visiting the area. If you are especially lucky, you may catch a glimpse of an orca or a blue whale. Whatever you see, there is nothing quite like seeing these majestic giants of the deep in the flesh and we guarantee that the experience will stay with you for the rest of your life. You will also do a spot of traditional Icelandic angling on the tour and then your friendly guide will barbecue them by the harbour with you when you get back. By the smaller Vatnsnes peninsula further West along our route, is the towering basalt sea stacks at Hvítserkur, which locals believe is either a petrified troll or a mighty dragon drinking from the sea. Whichever is correct, it is an incredibly beautiful and photogenic place that you simply must see while you are in Iceland. Your penultimate stop of the day is around 40 minutes further down the road, there you will find a deep craggy gorge called the Kolugljúfur Canyon. It has been hewn into the landscape by streams and glacial run-off from the surrounding area and has a multitude of gushing waterfalls that make it truly spectacular. There are several locations along the cliff-edge that provide a panoramic view of the entire canyon: the perfect way to finish an adventure filled day. We will arrange a traditional Icelandic hotel for you somewhere in the Vatnsnes area, which is where you will spend the evening. Day seven will take you to the spectacular Snæfellnes Peninsula, famed for its isolated nature and diverse landscapes. It is also slightly further off the beaten track than some of Iceland’s more famous sights, with tourist preferring the South Coast or Golden Circle Route to it. However, it remains breathtakingly beautiful and well worth a visit. Some even consider it to be the best way to explore the land of fire and ice, thanks to its imposing volcanoes, mighty glaciers, rugged lava fields, gushing waterfalls, amazing sea stacks, jet-black beaches and much, much more. The first stop of the day is the giant Grabrok Crater in Borgarfjordur, it was formed by a large fissure eruption around 3,400 years ago and rises 170 meters above the surrounding area. 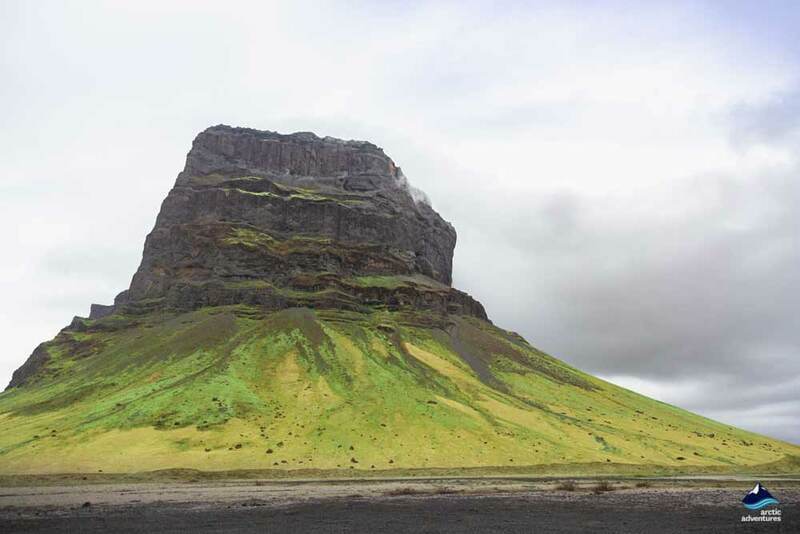 This makes it perfect for those who want to hike up it and survey the beauty of Borgarfjörður and the crater itself. The rustic charm of the Stykkishólmur Village is another thing that should not be missed: replete with picturesque houses and an authentic local atmosphere it is a great place to snap some photos and enjoy traditional Icelandic cuisine. It is also considered to be the gateway to the Westfjords as it is the place where the ferry departs from. 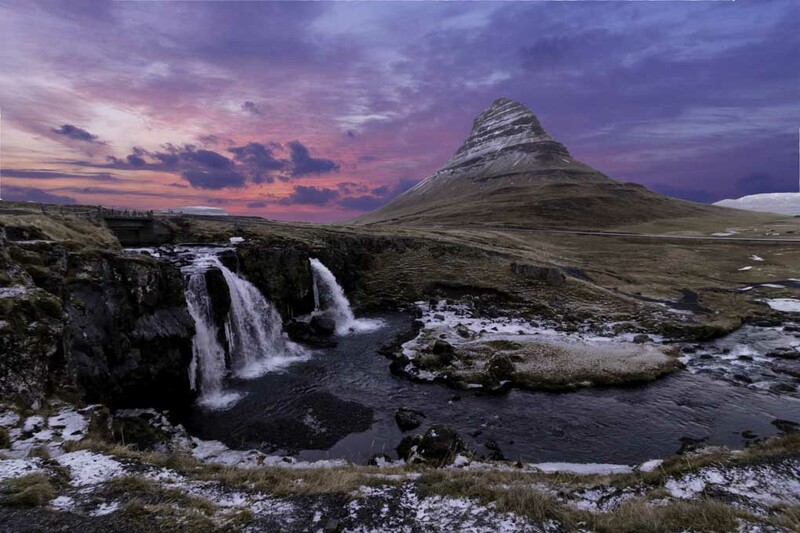 The exquisite Kirkjufell Mountain (church mountain) can make a genuine claim to be the most beautiful place in all of Iceland. It spirals 463 meters into the air like a strangely shaped emerald pyramid and towers over the equally beautiful Kirkjufellsfoss Waterfall, making for an awe-inspiring picture that every visitor to Iceland should see. The dramatic Djúpalónssandur beach is formed with the smoothest pebbles , which provide a stark contrast to the ocean blue waters of the sea. It is framed by a series of stunning lava encrusted cliffs, making for some of the most incredible coastal scenery that you will ever see. The lonely and slightly foreboding Lóndrangar Castle is a pair of oddly shaped rocks that gaze out to sea like an imposing sea fort. Their isolated nature and the dramatic way that they contrast to the surrounding area has made them a popular attraction that all visitors are bound to appreciate. Local legend believes that the castle belongs to the elves that inhabit the area and it is considered bad luck to approach and disturb them. Your final stops in Snæfellsnes are Hellnar and Arnarstapi a duo of remarkable coastal villages that are very close to each other. Arnarstapi plays host to a naturally formed harbor, replete with a series of gorgeous basalt stacks and an arch-like rock formation, which looks a bit like a window into the ocean. While Hellnar is one of the oldest villages in Iceland, dating back to at least the 16th century it used to be a very important part of Iceland’s fishing industry. It is more of a tourist center today, with visitors flocking from around the world to see the incredible rock formations that are dotted around its coast. We will arrange accommodation for you in a country hotel in the Snæfellsnes area. The penultimate day of your incredible adventure will begin at Ytri Tunga: a golden beach where playful seals like to bask in the summer sun. The seals are friendly and fairly acclimatized to humans, meaning that they will often climb up onto the rocks and be easily spottable. There is nothing quite like seeing these amazing animals in the flesh, making it a wildlife lover’s dream. Around 30-minutes east of Ytri Tunga lie the breath-taking Gerduberg cliffs, where rectangular basalt stacks rise out of a grassy meadow. 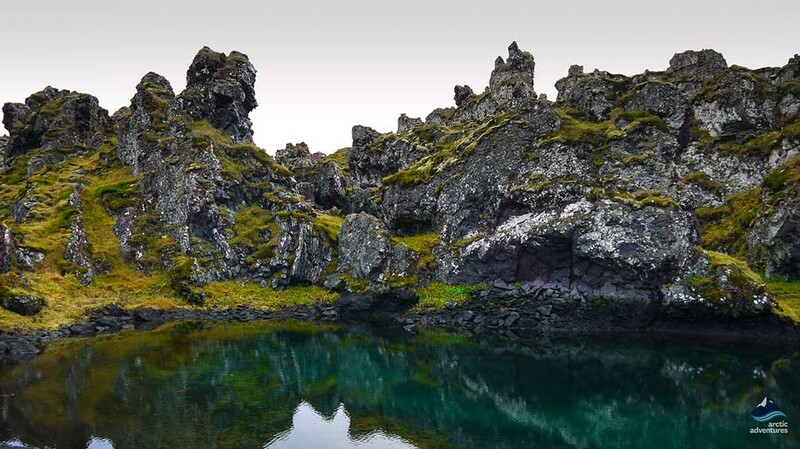 It is rare to see basalt stacks so far inland, making them a unique and beautiful natural heritage site that all visitors are bound to enjoy. About an hour’s drive from there lies the Deildartunguhver Hot Spring, which pumps over 180 liters of scalding water every second. The spring is used by towns in the surrounding area to supply hot water to homes, making this natural wonder incredibly eco-friendly. The next stop of the day is the breathtakingly beautiful Hraunfossar Falls, where a multitude of tiny white streams run down a black lava face. This turns the waterfall into a cacophony of tiny streams, which is a mesmerizing sight that will remain with you for the rest of your life. The surrounding area is populated by dark green trees, which only enhances the beauty of the entire scene. The road continues on to Akranes town, which is renowned for its pair of rustic lighthouses that attract visitors from across the country. The larger of the pair is open to the public, allowing visitors to scale its stairs and enjoy a spectacular view of the sea and surrounding area. On a clear day, you will be able to see as far as Reykjavik, while there is also a fascinating photo exhibition in the lighthouse, which charts the history of the town. Your final night will be spent in the capital area, Reykjavik, Kópavogur or Hafnarfjörður, where you can enjoy the bustling nightlife and relaxed café culture of Iceland’s capital. The final day is slightly less organized and is largely dependent on the time of your flight: if you are flying in the morning then you can head straight to the airport, while if you are flying, later on, you can take a relaxing bath in the iconic Blue Lagoon or explore the volcanic Reykjanes peninsula, replete with craggy rock formations, a fissure between the North American and Eurasian tectonic plates, bubbling hot springs and a plethora of other amazing sights. The iconic Blue Lagoon is one of the finest naturally occurring geothermal spas in the world and has been rated as one of the 25 wonders of the world in a recent poll. There you will find volcanically heated, milky-turquoise, nutrient-rich water that is ideal for relaxing in. This combined with the beauty of the surrounding area and the healing properties of the water make it an experience that everyone should add to their bucket list. * Please note that admission to the Blue Lagoon needs to be booked separately and we recommend that you book beforehand in order to secure your spot. 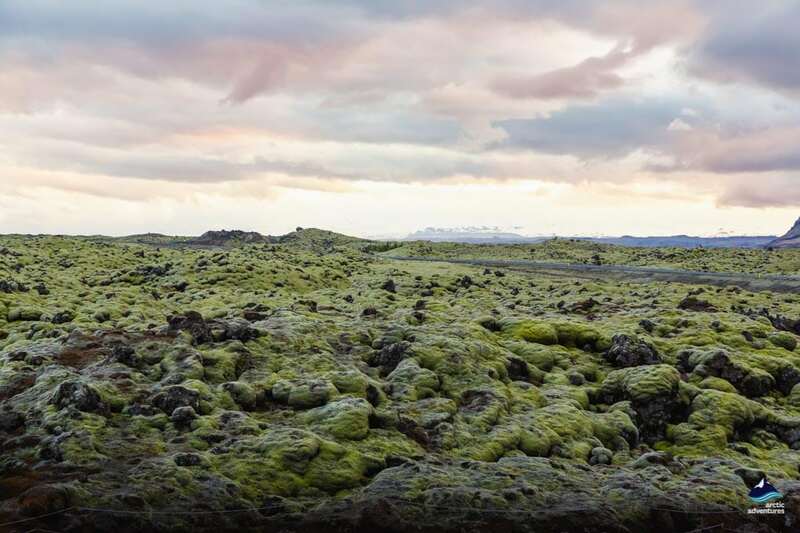 The otherworldly scenery of the Reykjanes Peninsula makes it the perfect place to bid goodbye to the land of fire and ice, there you will find craggy moss-carpeted lava fields, picturesque villages, isolated lighthouses and a whole lot more. The peninsula straddles the Mid-Atlantic Ridge, meaning that you will be able to gaze across the rugged fissure that bisects two continents. This coupled with bubbling mud springs, boiling fumaroles and a whole lot more makes it the perfect place to end your Icelandic adventure.